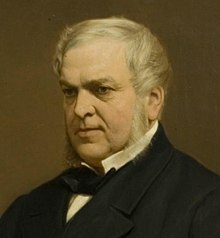 John Forster (2 April 1812 – 2 February 1876), was an English biographer and critic and a friend of author Charles Dickens. He was born at Newcastle upon Tyne. His father, a Unitarian who belonged to the junior branch of a Northumberland family, was a cattle-dealer. Well grounded in classics and mathematics at The Royal Grammar School, Forster was sent in 1828 to the University of Cambridge, but after only a month's residence he moved to London, where he attended classes at University College, and entered the Inner Temple. His main interests were literary. He contributed to The True Sun, The Morning Chronicle and The Examiner, of which he was literary and dramatic critic; and the influence of his powerful individuality soon made itself felt. Lives of the Statesmen of the Commonwealth (1836–39) appeared partly in Lardner's Cabinet Cyclopaedia. Forster published the work separately in 1840 with a Treatise on the Popular Progress in English History. It obtained immediate recognition, making Forster a prominent figure in a distinguished circle of literary men which included Leigh Hunt, Edward Bulwer-Lytton, Thomas Noon Talfourd, Albany Fonblanque, Walter Savage Landor, Robert Browning, Thomas Carlyle and Charles Dickens. Forster is said to have been engaged to Letitia Landon, but the engagement was broken off, and she married George Maclean. In 1843, Forster was called to the bar, but he never practised as a lawyer. In 1855, Forster had been appointed secretary to the Lunacy Commission and, from 1861 to 1872, held the office of a Commissioner in Lunacy. His valuable collection of manuscripts, including the original copies of Charles Dickens's novels, together with his books and pictures, was bequeathed to the South Kensington Museum. For some years he edited the Foreign Quarterly Review; in 1846, on the retirement of Charles Dickens, he took over The Daily News; and, from 1847 to 1856 he edited the Examiner. From 1836 onwards, he contributed to the Edinburgh Quarterly Review and to the Foreign Quarterly Review a variety of articles, some of which were republished in two volumes of Biographical and Historical Essays (1858). In 1848 appeared his admirable Life and Times of Oliver Goldsmith (revised 1854). Continuing his researches into English history under the early Stuarts, he published in 1860 the Arrest of the Five Members by Charles I: a Chapter of English History rewritten, and The Debates on the Grand Remonstrance, with an Introductory Essay on English Freedom. These were followed by his Sir John Eliot: a Biography (1864), elaborated from one of his earlier studies for the Lives of Eminent British Statesmen. In 1868 appeared his Life of Landor. On the death of his friend Alexander Dyce, Forster undertook the publication of his third edition of Shakespeare. For several years he had been collecting materials for a life of Jonathan Swift, but he interrupted his studies in this direction to write his standard Life of Charles Dickens. He had long been intimate with the novelist, and it is by this work that John Forster is now chiefly remembered. The first volume appeared in 1872, and the biography was completed in 1874. It was clearly an important work for the late nineteenth century English novelist George Gissing who wrote in his diary in January 1888, that it was "a book I constantly take up for impulse, when work at a standstill". A decade or so later Gissing was asked to revise Forster's work, and this was published by Chapman and Hall in October 1902. Towards the close of 1875 the first volume of his Life of Swift was published; and he had made some progress in the preparation of the second at the time of his death. Forster has been fictionalised in several recent neo-Victorian novels which centre on Charles Dickens. This includes The Last Dickens by Matthew Pearl (2009), Wanting by Richard Flanagan (2008), Girl in a Blue Dress by Gaynor Arnold (2008, renamed Michael O'Rourke), Drood by Dan Simmons (2009) and the forensic examination of the genesis of Pickwick Papers, Death and Mr Pickwick by Stephen Jarvis (2014) in which Forster is cast as the major villain of the piece. He was portrayed by Justin Edwards in the film The Man Who Invented Christmas. The film also implies that Forster was Dickens' inspiration for the Ghost of Christmas Present. ^ "Forster, John (FRSR826J)". A Cambridge Alumni Database. University of Cambridge. ^ Davies, James A. (1983). "Chapter 8". John Forster: A Literary LIfe. Rowman & Littlefield. p. 108. ^ Coustillas, Pierre ed. London and the Life of Literature in Late Victorian England: the Diary of George Gissing, Novelist. Brighton: Harvester Press, 1978, p.20. This article incorporates text from a publication now in the public domain: Chisholm, Hugh, ed. (1911). "Forster, John" . Encyclopædia Britannica (11th ed.). Cambridge University Press. Wikimedia Commons has media related to John Forster (biographer). "Forster, John" . New International Encyclopedia. 1905.